Classical Network, with all links (at least until 100k). Centered Network, where only the actors "near" Arnold Schwarzenegger and Peter Weller are visible. To change the color of a node, in order to make it more visible, add a nodes array, in which each element is an object with a value and a color property. If you don't provide a color, their color will be the current one, saturated. You can also precise in which field the value has to be colored. Selected Network, where only documents matching the mongodb selector are visible (using a MongoDB Match Query Criteria, but within a JSON, thus using quotes around operators). 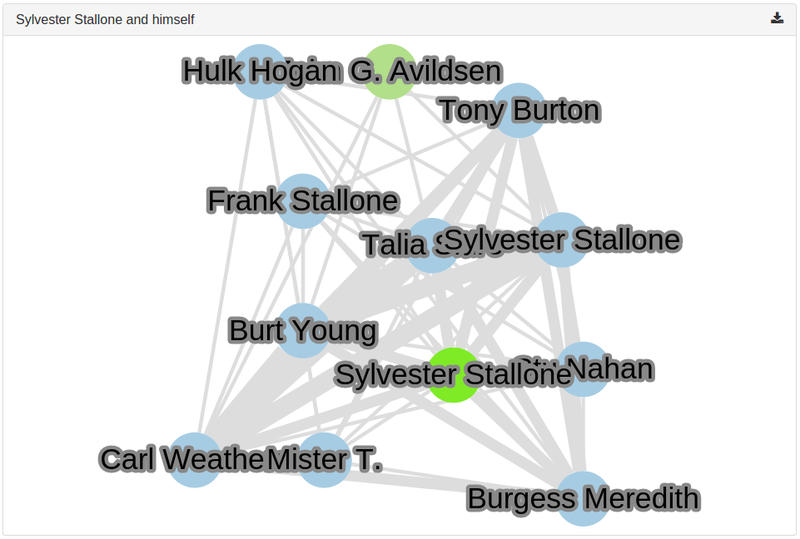 Threshold Network, where only links above the threshold value are displayed (in the example: the actors linked are those who played at least in 3 films together). "help": "Network of actors, which common films are at least 3"
"help": "Network of directors, year and films"
You can set the color of the nodes field by field. Example: actors field in green and director field in blue.